Curious how to improve your poker game? To play poker successfully you better know your hand and the odds of winning with it. Available calculaters often only compute the odds if you provide the card of your opponents. Since it's unlikely they tell you what's on their hand these calculators are rather useless during the game. Universe-poker proudly presents an Android App for Texas Hold'em Poker that provides you with the odds of winning solely based on the information available to you. 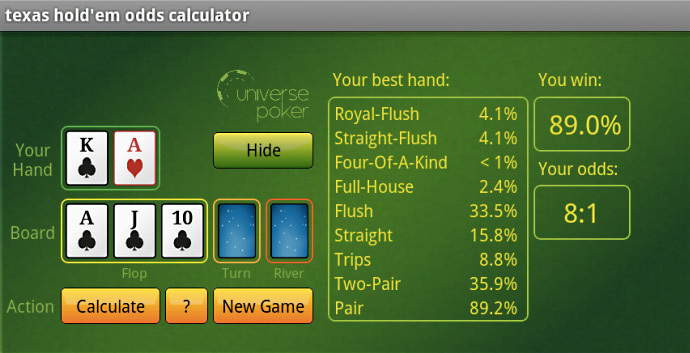 The Texas Hold'em Odds Calculator from universe poker ... now available from Google Play. With the cards of your opponent remaining unknown, calculating the odds becomes a hard mathematical problem. The combinatorial search space in a Texas Hold'em poker game grows extremly large very quickly, especially when many players are in the game. To solve this problem, our App takes concepts from modern computer science and combines them with the capability of current smartphones. The universe poker Texas Hold'em Odds Calculator provides you with the information that you need when you need it the most whereever you go. Check out our poker tshirt shop for a selection of awesome shirts and tops and get yourself a treat. Just visit four-aces-king-high.de.